If you have followed our blog or a financial advisor or investor, you already know that an investment portfolio is generally a collection of the assets that are owned by individuals or managed by financial advisors. In order for these portfolios to be successful, diversification is essential in every field and it is important for advisors to keep their client’s investments and assets diversified to cover all future aspects. Of course, you are aware of the saying that is tossed around the investing work, advising that it is risky to put too many eggs into one basket, as all efforts will be worthless if said basket falls. That said, it is important for advisors and investors to understand the ins and out of diversifying, developing, and growing their financial investment portfolio up to its ideal position. With the expanding investment technology and stock market awareness, more and more advisors are investing into the assets but are forgetting the basic knowledge and ways of investing their money in order to attain maximum profits out of it. However, this is one of the main reasons investors trading in the market are missing the essential features that are important to creating an ideal financial investment portfolio. 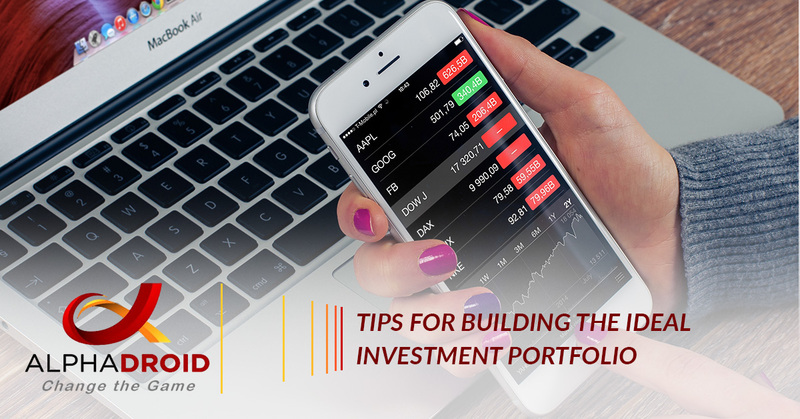 In this blog, we are going to cover some helpful tips that will help financial investors get off to a good start in creating an ideal portfolio for their investments and assets. Without diversifying investments into various asset classes, an investment portfolio can potentially go into vain and result in significant losses. It is best for investors to not ‘put all their eggs in one basket’ and invest their money into a wide range of different asset classes. This will help reduce risk, therefore increasing the chances of attaining higher returns. Trading investments too often can really do some damage in the long run. It is best to avoid trading too frequently and let your investments gain returns over time. Investments are less likely to provide instant returns. However, letting investments sit for a certain period of time can potentially lead to a significant profit return. Give the required time to the assets by classifying them into the short term or long term investment plans. Investors should always keep track of their investments and trades that are taking place, plus they should always be keeping an eye on any profits or losses that their money is experiencing. Realizing that investments are being affected by certain factors and stocks are going into a loss, investors should trade them off and invest the money they gain in other funds. There is not a specified number to which an advisor should be investing. However, when the number of investment funds go beyond fix or six, then it may be time to consider not adding any additional funds. It is important to analyze the investments to make sure that money is not being invested too much into an asset that isn’t necessarily needed. The diversification is essential to the success of a portfolio, once a balanced equation is created with an investment portfolio, it likely will cover all of an investor’s needs for the present and future, making it unnecessary to add additional classes of investment assets. Though its recommended to reanalyze, re-check, and re-balance financial investment portfolios on a consistent basis, adding additional investments to a portfolio can potentially make it unmanageable. Many investors make the mistake of purchasing investments in the heat of the moment without even knowing how to properly manage them. Not knowing how to use investments constructively to gain profits is not only a waste of time but a waste of money as well. It is necessary for investors to have reasons or purpose for investing funds into owned asset classes. Financial portfolio management software makes investing and trading easier than ever before. With automated trading strategies, advisors can manage client portfolios with ease. One of the best financial portfolio management software available for advisors and investors is AlphaDroid! With AlphaDroid, investors can better analyze, construct, and compare investment portfolios. Our investment portfolio management software helps advisors by providing a precise and disciplined approach to productively, allowing them to catch the best days in the market while avoiding the worst. By following these tips above, investors can be on their way to building an ideal financial investment portfolio. One of the best ways to have success and the ability to manage portfolios with ease it to utilize investment portfolio software, like AlphaDroid. AlphaDroid’s automatic trading strategies and asset allocation software help predict the market by following trends, helping advisors reduce risk and promote higher returns in their portfolios. If you are interested in seeing how AlphaDroid can help your investment portfolio be successful, start your free trial today!